The "single individual" which contributed 98.7% of the funds raised by Carolina Rising, the 501(c)(4) "social welfare" front group that spent 97% of its money -- nearly $5 million -- getting Thom Tillis elected to the U.S. Senate ... that single individual was Crossroads GPS, the super PAC run by Karl Rove (as revealed by newly available tax records examined by the Center for Responsive Politics and other watchdog groups). The master mind of Carolina Rising was Dallas Woodhouse, who is now writing ungrammatical emails as executive director of the North Carolina Republican Party. That ain't all. 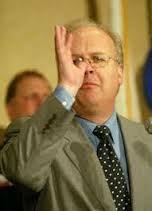 Crossroads GPS and Mr. Rove intend to be every bit as active in North Carolina in the 2016 general elections. The corruption of North Carolina politics through secret big money and pay-to-play bribery is sinking us further into a swamp where the corpse of democracy is quickly rotting.